There’s little more exciting than buying a new home. Whether you’re searching for a starter home, a place to retire or even a vacation house, the home buying process is thrilling – and overwhelming! Our team of knowledgeable staff will be with you every step of the way. We’re intimately familiar with the Emerald Coast real estate market, from investment properties and condos to single-family dwellings. We know that your ideal home is as unique as your circumstances; together we’ll move you into the home of your dreams. Searching for your perfect property is just the first step. From listing to relocation, we will guide you through the entire home buying process. As you search for your perfect home, you know what’s most important to you and your family. Perhaps you’re looking for a short commute, top-notch school systems or great nightlife options. Maybe you just want to have easy access to fish the Okaloosa Island Pier. Set a budget and create a wish list. We will help you find a lender and secure pre-approval. Then, use our comprehensive search to find a home that fits your budget and criteria perfectly. Be sure to save your search as you shop available homes. As new Emerald Coast homes meeting your criteria enter the market, you’ll be notified instantly via email. It’s easy to request more information about a home you love or to schedule a showing. Contact us directly via the listing or simply click “Schedule a Showing” to set up an appointment. Don’t have time? Be sure to save the listing to your favorites by clicking the "♥" icon. 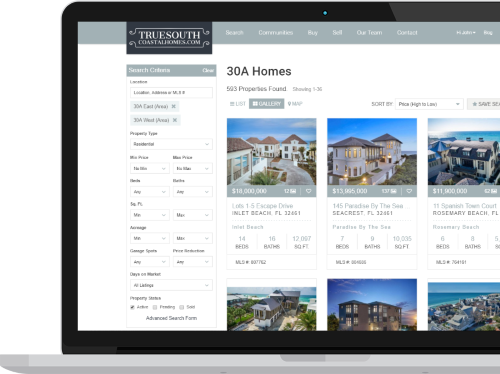 TrueSouthCoastalHomes.com is more than a real estate website – we’re your homebuying partners. Our experienced agents will help you secure a mortgage, negotiate the price of your home and submit an offer. And our relationship doesn’t end there. We’ll be with you through inspections, appraisals and even when closing on your home – at no cost to you. We’re excited that you’ve chosen TrueSouthCoastalHomes.com as your real estate partner. Contact us today to begin the search for the home of your dreams. Let us help you find your home on the coast.